“The Beat Goes On” are a professional tribute to The Beatles, giving their audiences the opportunity to travel back in time and relive the raw energy and genius of the original Fab Four. The show follows The Beatles career through the swinging sixties from the days of the Cavern Club to the last rooftop gig playing songs from EVERY Beatles album. “The Beat Goes On” offer an outstanding set of authentic costumes, instruments and professional sound quality for any event. Playing renditions of all of The Beatles hit songs as well as those songs the enthusiasts just have to hear. ‘The Beat Goes On’ are great family entertainment for any event. Although The Beatles split up in 1970 their musical legacy still lives on. Fans how ever old or young welcome the chance to hear tracks such as “Love Me Do”, “Back in The USSR” and”I Want to Hold Your Hand” when tribute act The Beat Goes On take to the stage at any Venue. 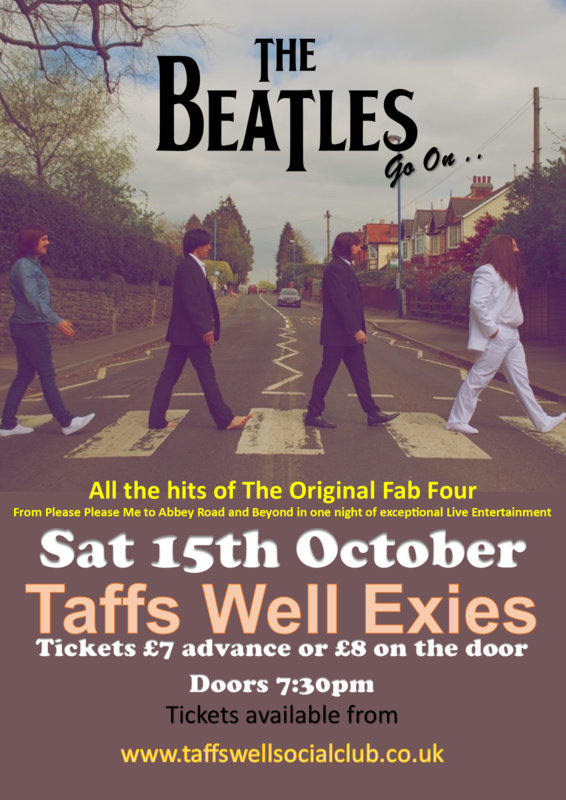 Since October 2012 “The Beat Goes On” have been re-creating the excitement, raw energy and authentic sound of the original Fab Four across South Wales and South West England with recreations of classics such as Hey Jude, Twist and Shout and I Feel Fine. A combination of great powerhouse vocals and close Vocal harmonies pumped out with a driving backline, The Beat Goes On will play classic Beatles tracks and entertain all night long.